Santa Clara is a neighborhood and community located at the north end of Eugene. At the last census count, the population was approximately 13,000. This neighborhood intermixes older farmhouses with newer home construction and many homes are located on larger lots. Part of the area’s appeal is the short drive to roadside stands that offer fruit and vegetables, and two local farms, Thistledown and Lone Pine, that both have fresh produce and fun activities for people of all ages. You will also find the convenience of Santa Clara Square, an area shopping plaza with a variety of shops and services.There is always something to do in the Santa Clara area, including outings to the many local parks. Two such parks are Arrowhead Park, popular for its playground and sports field, and Aubrey Park, a 6 acre park with Spring Creek running through it and home to all kinds of wildlife! Either would be a great place to visit and enjoy the walking paths or to study nature. See a home for sale in Santa Clara you would like to tour? Call us today! 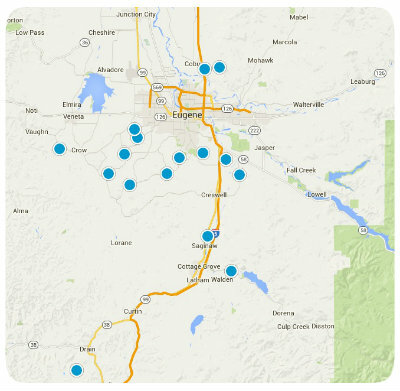 For Lane County market reports click HERE.